Item in stock in AU and is despatched in 24 hours unless stated otherwise. We use our own custom designed LP/7 packaging to protect your order. 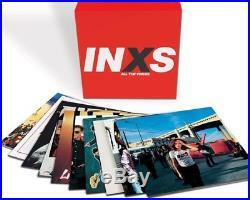 INXS All The Voices 180gm vinyl 10 LP box set +download. IN STOCK IN AU. What Would You Do. Just To Learn Again. To Look At You. Old World, New World. Melting In The Sun. I Send A Message. Dancing On The Jetty. Love Is (What I Say). Kiss The Dirt (Falling Down The Mountain). Shine Like It Does. Good + Bad Times. Guns In The Sky. Never Tear Us Apart. Faith In Each Other. Who Pays The Price. Welcome To Wherever You Are. Baby Don’t Cry. Full Moon, Dirty Hearts. I’m Only Looking. Please You Got That… Cut Your Roses Down. Show Me (Cherry Baby). Don’t Lose Your Head. I’m Just A Man. We Are Thrown Together. Brand new and sealed. Black Sabbath The Ten Year War limited n. The Avalanches Since I Left You US 2017. INXS Kick Australian 2016 reissue RED vi. GrooveWasher Record Vinyl LP Cleaning Ki. Anti-Static Carbon Fiber Record LP Vinyl. Metallica Master Of Puppets vinyl 3 LP /. Pink Floyd Dark Side Of The Moon PFR 201. Silverchair Frogstomp ltd 20th anny 180g. Q: Are the items you sell new? A: The items we sell are brand new and unused official releases supplied to us by record companies, unless stated otherwise in the listing. Generally all items are sealed (this will be stated in the listing title). Occasionally we may open an LP to confirm any colour variant. We sometimes sell used items, this will be shown in the listing. Q: Are the items you sell in stock? Occasionally we may offer pre-order titles and the estimated date when these will be in stock is shown in the listing. Our products are sourced from Australia, USA, Europe, UK and elsewhere; unless otherwise stated the product may have come from any of these countries. Condition; unless otherwise noted our stock is brand new and generally sealed. Picture discs – please note; due to their manufacturing process picture discs generally have poorer sound reproduction and can sometimes be warped. Q: How can I pay for my order? A: Within Australia all LPs and box sets are sent by Australia Post eParcel, this service is fully trackable (certain lower value items like CDs and 7s records may not be sent with tracking). We also offer express post, this option is available in the checkout. All overseas orders are sent tracked and this tracking is usually visible on your local country’s postal service’s website around a week after despatch. Q: Do you use any special packaging to send LPs, 7s and box sets? We also place your LP in a plastic sleeve prior to packing to further protect it. In addition we have our own custom designed 7 mailers and will send box sets and large orders in larger boxes with extra packing. You can view this option here. Q: What does MOV mean in your listings? A: MOV stands for Music On Vinyl, a reissues and new issue vinyl label. Please note MOV titles generally come in resealable sleeves, all are brand new and unplayed. We may remove the LPs from jacket/sleeves to prevent seam splits. Q: What are the download codes that are included (if any are stated)? A: PLEASE NOTE: if we are advised by suppliers that download codes are included with an LP or box set we will state this in the listing, however on occasions download codes are not provided or may be provided but may not work in Australia or in your country (if different). We are not responsible for supplying a working download code in the event one is missing or is included but does not work in your territory. We will do our best to make good in such circumstances but can not guarantee any useable card will be supplied. Q: If there’s a problem with my order when I receive it what can I do? Check our feedback to see other buyers’ experience with us. We use custom designed high quality LP, 7 and box set mailers to send your order. This minimises the chances of any damage in transit. Overseas: price is shown in the listing – please select your country to view the cost. NOTE: express post is not available on every item listed. For overseas deliveries you can track your order on your local post offices web site (for most countries, does not apply to every country). Registered (or Pack & Track service) and Express Courier post is available for most items for other countries (outside Australia). Please note we will use a tracked service if you choose registered or pack & track unless you specifically request otherwise. Other areas will take longer, especially WA and regional locations. If your order has not arrived within the time expected please check with your local post office to see if your order is being held there. Tracking is NOT available when purchasing single CDs/7 singles only. “AusPost Registered Post International Parcel” generally faster/more secure service than above, includes tracking (see below). “AusPost Express Courier International” typically 1 week service worldwide after despatch , includes tracking (see below). Add all items to your basket first and checkout in one go. For example; – In the UK you can track your order on the Parcel Force web site – In the US you can track your order on the United States Postal Services web site. Please also check at your local post office or postal depot as your order may be held there. We will NOT lodge an enquiry with Australia Post for any delayed items until 6 weeks after despatch of your order. If you specifically want registered post please note this in your order comments. United Arab Emirates/Dubai customers – you MUST choose Express Courier International for your order otherwise it will be cancelled. Express Courier is NOT guaranteed. There is NO change of mind for overseas (non-Australian) orders. Check the listing for details of the offers available at the time. (not all listings are included). Multiple titles in the same listing count as only 1 item for discount purposes. Certain items are excluded; such as CDs, cassettes and accessories. This offer may not work on certain devices, such as mobile phones, please use a desktop or laptop to access the offer once the link has been provided. PLEASE NOTE: discounts do NOT apply to auctions. Welcome to Discrepancy Records! Australia’s vinyl LP record store owned and operated by Aussies! We have one of the biggest selections of new vinyl LPs in Australia. All orders are sent by Australia Post with tracking (unless stated in the listing). If you are looking for something we don’t have please get in touch, we are more than happy to hunt it down for you! See Our Entire Range. The item “INXS All The Voices 180gm vinyl 10 LP box set +download NEWithSEALED” is in sale since Thursday, March 24, 2016. This item is in the category “Music\Records”. The seller is “discrepancy-records-au” and is located in Melbourne. This item can be shipped to Australia, North, South, or Latin America, all countries in Europe, all countries in continental Asia, New Zealand.